sorry, once your order has been confirmed, no changes are allowed. once i place my order, when does it ship? our typical turnaround time is 3-5 business days. personalized orders require an additional 1-2 days. please know, we do our best to get the product to your door as quickly as possible, but during peak seasons, the turnaround time may be affected. shipping time is in addition to the processing time. please note, we ship out of greensboro, nc. we accept mastercard, visa, american express, and discover credit/debit cards and buckhead betties gift cards. how do i report a damaged or incorrect item? shoot us an email at shop@thebuckheadbetties.com. please note, all returns must be handled within 14 days of receipt. at thebuckheadbetties.com, we want you to be completely satisfied when shopping with us which is why we inspect your order carefully before shipping it to you. if a product does not meet your expectations or you are not satisfied with your purchase, we will gladly accept a return of unused, unworn merchandise (with tags attached). you may return the product for a replacement or a refund within 14 days of the receipt of your order. any returns requested outside of the 14 day policy will be denied. all returns must be reported via email to shop@thebuckheadbetties.com. we will send you a return authorization number, and at that time, your return my be sent back to us. important: shipping fees are non-refundable unless merchandise is defective. all sale items and personalized items are final sale, and cannot be returned. please note, any merchandise received not meeting this criteria will not be processed. how does apparel sizing run? our apparel typically runs true to size. see our sizing chart for more info. how do you care for your apparel items? all apparel items are best to wash cold and hang dry. each item varies. info can be found under additional information on the product page. love your stuff! how do i contact you about marketing and press inquiries? thanks! email debbie@thebuckheadbetties.com with any questions or opportunities! what order should my initials be in my monogram? great question! 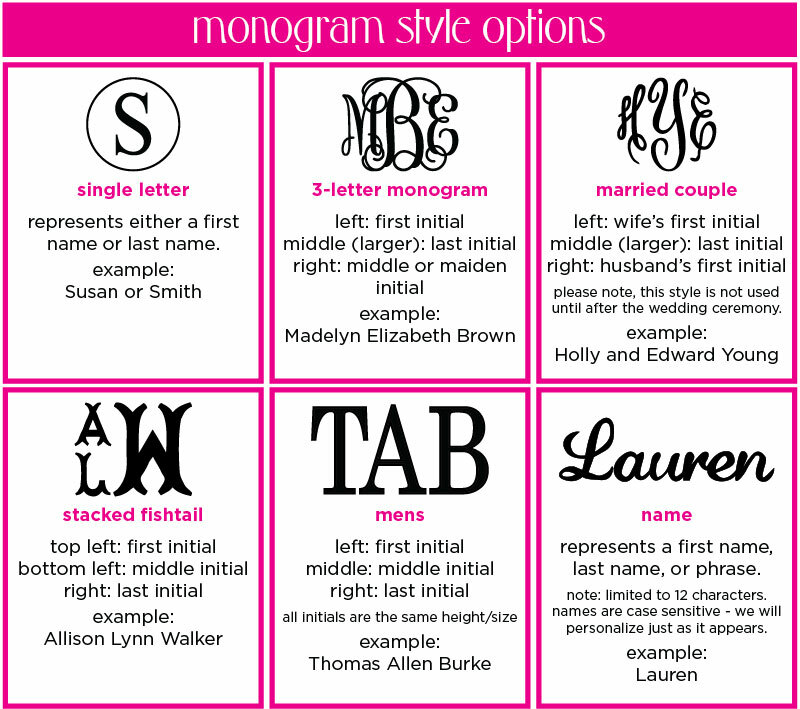 take a look at our personalization guide to make sure you get that monogram just right. please review every detail carefully before you submit your order - monograms will be stitched exactly as typed. personalized items cannot be returned.